'Disgraced' runs through Feb. 18 at Left Edge Theatre. 50 Mark West Springs Road, Santa Rosa. Thursday–Saturday, 8pm; Sunday, 2pm. $25–$40. 707.546.3600. PRESSURE COOKER ‘Disgraced’ explores Islamophobia, assimilation, bigotry and more in a tight 90 minutes. Blistering drama takes the stage at Santa Rosa's Left Edge Theatre with the North Bay premiere of Ayad Akhtar's 2013 Pulitzer Prize-winning drama Disgraced. Akhtar has taken the "friends drink to excess and soon truths are revealed" theatrical trope (see Who's Afraid of Virginia Woolf?, etc.) and dragged it into the 21st century. Amir Kapoor (Jared Wright) is a mergers and acquisitions attorney who's changed his name and family history and abandoned his Muslim faith in an attempt to climb the corporate ladder. His wife, Emily (Ilana Niernberger), is an artist whose work is heavily influenced by Islamic culture. She's eager to have her work displayed by Isaac (Mike Schaeffer), a museum curator and the husband of Jory (Jazmine Pierce), a fellow attorney at Amir's firm. All seems to be on track until Amir appears at a court hearing after repeated entreaties from his nephew (Adrian Causor) and under pressure from Emily for an imam accused of raising money for a terrorist organization. A short blurb in the New York Times about Amir is the catalyst for the action that ensues at a dinner party where Isaac wishes to share some happy news. Akhtar manages to address issues of assimilation, cultural appropriation, Islamophobia, anti-Semitism, bigotry, racism, workplace inequity, misogyny and religious and political fundamentalism in 90 compact minutes. 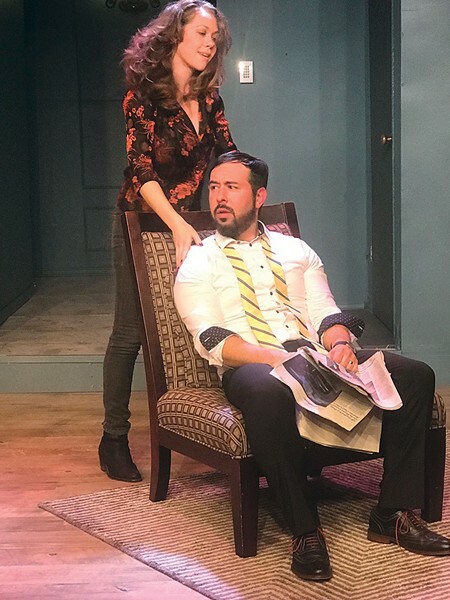 The action all takes place in Amir and Emily's apartment with two short expositional scenes prefacing the play's main moment—the dinner party. It's a party that begins well enough, but after ugly truths are revealed, ends in a shocking act of brutality. While the dinner-party setting may be stock, these characters are not. Director Phoebe Moyer and the cast take a no-holds-barred approach to the material, and it pays off. Each character's complexity is refreshing and provides a worthy challenge for the experienced cast. The company is excellent in its portrayals of individuals who struggle with their core beliefs and the realization that they may not be who they think they are or—more frighteningly—that they are who they think they are. That struggle was mirrored by the audience in post-show conversations. The best theater starts a dialogue, not just about the show, but of the issues raised. This production should lead to a lot of discussions and maybe some heated, but hopefully civil, arguments. There's no disgrace in that.